The World of Althéa: Increased Spell Power! (And More Stats) POLL: Will You Craft? Increased Spell Power! (And More Stats) POLL: Will You Craft? 1) GOLD COST: First and foremost (and assuming the PC has the abilities in the first place), I could see that the cost of crafting a wand is considering high, even for the least of spells. In the D&D 3E rules, wands start from 375 gp for zero level spells and raise to over 20, 000 gp for a 4th level spell. 2) XP COST: Although not a factor in NWN, a spell caster was also expected to sacrifice XP when making an item. I mention it here just for completion of info. 3) DISPOSABLE: Most rules assume wands are disposable. Once the charges are used, the wand is destroyed. Therefore, a crafted wand has a limited life. 2) XP COST: There will never be an XP cost for crafting items in Better The Demon. 3) RECHARGEABLE: Regular readers will know there will be an item that can be acquired quite regularly according to ones abilities: The Life Essence. This item serves a number of purposes throughout the game. It will also have the ability to recharge a wand with (10 - spell level) charges as long as the wand has at least one charge, as it is still destroyed if the last charge is used. I know one of the first questions raised will be "will this affect game balance?" I believe the answer is "no". After all, crafting a wand still requires the PC to pay for its creation in the first place. The main difference is that its creation becomes a real viable option as something to spend gold on and with the ability to keep it charged, becomes a more useful item to help supplement the spell casters spell ability. I actually believe that this system will also go some way to help overcome the frustrating position of a low level spell caster casting their couple of spells in an eight hour period and then being unable to do much more in the way of helping with spells. Now, they can craft wands of spells that will be of most use and have the ability to help maintain the wand with Life Essence they might find. The party's wizard could craft a wand of magic missiles and the cleric a wand of cure light wounds for only 350 gp each! No longer will the spell casters be forced to rest after the first combat of the day. 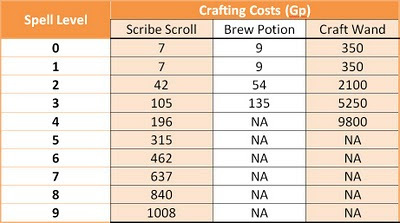 Note, each basic crafting item has a basic cost of 1, 1 and 5 gp for scroll, potion bottle and wand in the first place (UPDATED), but thereafter, the costs above reflect the basic minimum price a PC pays for the spell placed on the item. 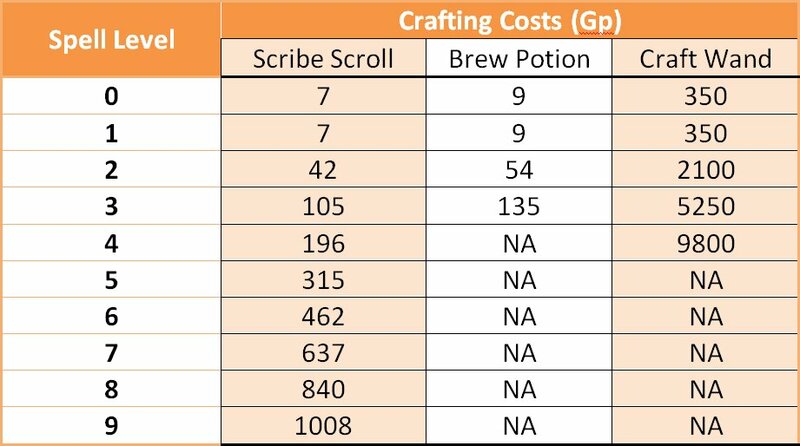 As mentioned above, if the PC can afford it (and has the ability), they can choose to pay more at time of crafting for the spell to cast at a higher level when used from the item. Note, scrolls work in a special way in Better The Demon, in that their power scales with the PC's own ability. E.g. A scroll of Magic Missile made at first level will cast more missiles if saved and used at a higher level at a later time, or if a higher level PC picks up and uses the same scroll. However, a scroll with a power higher than the user will take priority. As scribing scrolls requires nothing more than the feat, some gold and the ability to cast the spell in the first place, then I believe the above costs go a long way to encourage the player to prepare a collection of scrolls ahead of time, and especially knowing they scale with the PC's own ability. When the PC reaches third level, they can acquire the brew potion feat, and continue to prepare useful potions for the party as a whole at relatively low costs - and especially cheaper than any that might be available in the market. I decided to add a poll this week, with respect to whether these "improvements" and changes will encourage you to consider crafting in your adventures. As usual, any feedback (on any article mentioned in a blog) is most welcome. 1) Sports new colours (for ease of reading). 2) Gives a PC's highest CR (Challenge Rating) kill. 3) Gives a PC's overall percentage input for the party as a whole. 4) Gives the PC a title of "competence", ranging across a number of levels. (*) Note, I have gathered the various humanoid groups, such as orcs, goblins, etc into a single "Humanoid" group.